Chad grew up in cities throughout the state and currently resides in Waukesha County, Wisconsin. He graduated from Marquette University in 1997 (B.A.) and from Marquette University School of Law in 2000 (J.D.). While at Marquette School of Law, he clerked for the Honorable John J. DiMatto. 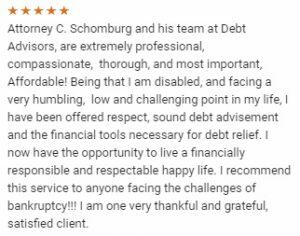 As partner/owner of Debt Advisors, Chad’s practice focuses on the representation of Chapter 7 and Chapter 13 bankruptcy debtors. 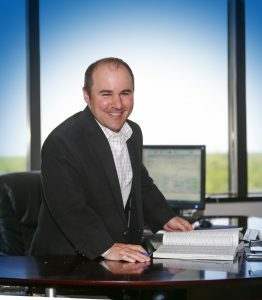 He has the experience of having personally advised thousands of consumer bankruptcy clients. He has given lectures and bankruptcy seminars for many groups, including the Meta House Women’s Shelter in Milwaukee. 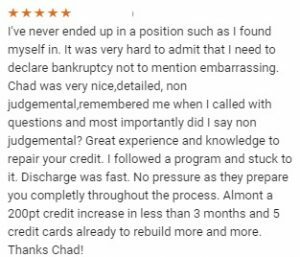 Chad also does Pro Bono work for Legal Action of Milwaukee, counseling individuals on how having an attorney is an important part of the bankruptcy process. 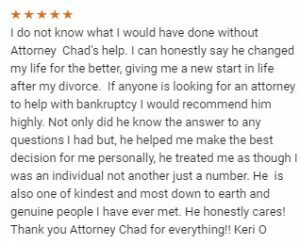 Over the past 6 years, Chad has successfully filed bankruptcies for every client he has represented. Chad has the distinction of being one of the top bankruptcy filers in Wisconsin over the last 6 years.